It's official. I'm moving on from Summer to Fall. At least in the wardrobe and shopping department. I want to hold on to Summer as long as possible, but now it's all about shopping for colder temperatures. I tried to hard to find some great Summer goodies on sale, but my heart just wasn't in it. Thank goodness sunglasses are wearable year round! And faux leather dresses area multi-seasonal, right? Seriously though, these earrings would match basically everything and these sunglasses are the perfect price for their trendiness. And I cannot even talk about these dreamy heels because I love them so hard right now. This is all making me feel particularly inspired, so I am off to keep organizing the closet and purging for the upcoming season! 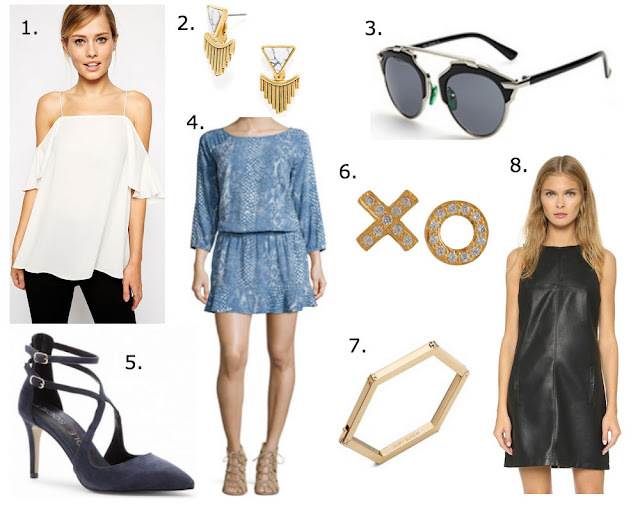 Love everything on your lust list, so much glamor and chicness! The baubles are my favorites! Love that blue dress! So pretty and perfect with booties for fall! I have that BB Dakota dress and I am so obsessed with it! It's a little hot in the summer though haha! Omg, those heels are everything! Love them!!! Love both of those dresses!! Except did you know that links #3-8 are all going to the sunglasses?!? Haha! Those sunglasses are amazing! I also love the blue dress! That would be fabulous with booties! I need that dress!!!!! I am all about the leather accents for the Fall right now!